To learn more and find a link to the application, please see our press release. Applications are due October 13 in the district office. + Haight – “New Haight Family Play Date” on August 13th from 2-4pm at McKinley Park, 2165 Buena Vista Ave. Veteran parents will come to meet Lum families and any other new families. K and TK playdates for all new students are planned. + Maya Lin- School Picnic (all students) August 6th, Crab Cove, 1-4pm;Kindergarten Welcome Potluck, August 11th, Washington Park, 5-6:30 and Ice Cream Social on August 18th, 5-6:30pm. Welcome ambassadors and signs for Lum at the picnic and social. + Otis – Aug 5 & 12, 10 am: Kinder Playdates at Krusi Park; Aug 6, 10 am: 1st grade Playdate at Krusi Park; Aug 18, 2 pm: Kinder Ice Cream Social in Kinder Yard; Aug 18, 3 pm: 1st grade Ice Cream Social at Tetherball Courts; Aug 18, 5:30 pm: Back-to-School Picnic on blacktop; Lum families encouraged to request buddy families to support transition at Otis! Great opportunity to meet other incoming K families! The schools to which Lum students are being relocated for the 2017-18 school year are hosting information nights on Thursday, June 15, 6:30-7:30pm for incoming Lum parents/guardians. These events will be adult gatherings meant to provide an overview of the schools, and to give parents/guardians an opportunity to ask questions. This will also be a great opportunity to learn of any back to school events at these schools so you and your students can become acquainted with the school communities. Please don’t hesitate to contact me with any concerns/suggestions/questions. I may not have the answers but I will help you find them! Lum PTA has created a Google survey to help us keep in touch next year. Many of us would like to know where our friends and classmates will be next year. The purpose of this survey is to gather that information to share just within our Lum community. This is a voluntary survey put out by parents, not by the school or the district. Please respond to these questions if you are willing to share your family’s plans with one another. We are only gathering information about current Lum students. 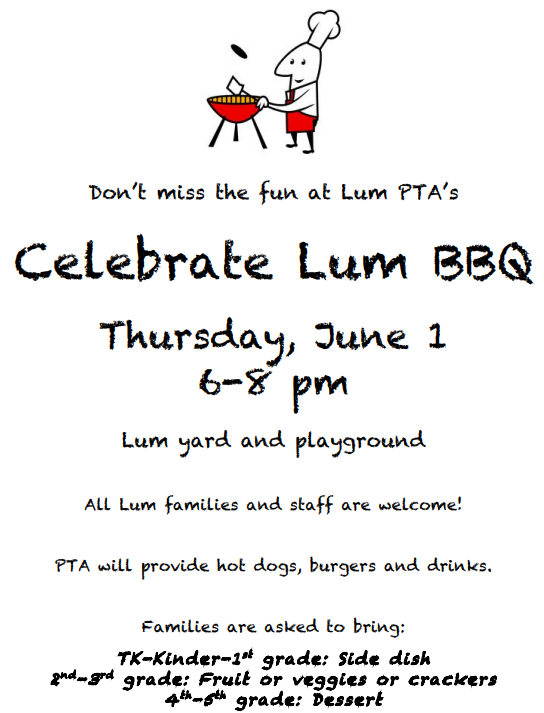 If you have other children who do not attend Lum this year, please do not include them in your responses here. Yogurtland in Alameda Landing will host Wood PTA’s last Dine & Donate on June 1, 2017 from 5:30-8:30pm! For this fundraiser, please show the attached flyer. The flyer can also be displayed as a picture or email on a mobile phone! *If we exceed $500 in sales, Yogurtland will donate 30% of the proceeds to Wood! On May 23rd the AUSD Board will vote on whether or not to close Lum. Before that vote, the district decided to survey our Lum community to find out where families would like their children to go IF the Board votes to close Lum. The purpose of the survey, that was sent out to all Lum families, is to give parents a voice in the relocation plan, IF one is necessary. It is especially IMPORTANT THAT FAMILIES WITH CHILDREN GOING INTO 4TH AND 5TH GRADE NEXT YEAR FILL OUT THE SURVEY. In the event of Lum closure, we have the option of setting up a new 4th and 5th grade program in the Wood Annex (the space that was used by ACLC until a few years ago). This would be separate from the middle school, with a separate lunch and bell schedule, and would let the 4th and 5th graders stay together, with fewer transitions, former Principal Cammie Harris, and the continued option to walk to school. Once the 4th and 5th graders graduate, (in 2 years) Wood would return to a middle school 6-8 again. Please vote for this option if it appeals to you. If you do not vote for it, it’s very likely that the WOOD OPTION WILL NOT HAPPEN. DISTRICT NEEDS RESPONSES BY 5/19.